By now, The “Can Dos” knew that storytelling was going to be fun. “Let’s make the Three Little Pigs less scary and more fun,” said Storyteller Bill.”I will tell the original story, then I will share how I retell the story so it is less scary and has a happier ending. The “Can Dos” nodded . Storyteller Bill cleared his throat and began to speak. “Once upon a time, there were three little pigs who lived with their mother in a meadow. One day their mother said, “You need to go out into the world and make your own way.” So they waved “goodbye” and went out into the world. The little pigs decided to build their houses in a meadow near the woods. The big bad wolf lived in the woods nearby. The meadow was big enough for all three houses and none of the pigs was afraid of the big bad wolf! The first little pig was very lazy. He decided to make his house out of straw from the meadow. Sure enough, the big bad wolf trotted out to watch him build the house. When the house was finished, the big bad wolf knocked on the door and asked to come in. When the first little pig refused, the big bad wolf huffed and puffed and blew the house down. The second little pig thought to himself, “I will be smarter. I will build my house out of twigs from the edge of the woods. That should be easy and safe.” But the big bad wolf came by and said, “You should not build a house with twigs from my woods. I will huff and puff and blow it down.” Sure enough, as soon as the house was finished, the wolf blew it down. THE HOUSE DID NOT FALL DOWN! The big bad wolf said to himself, “This cannot be. I will climb onto the roof, go down the chimney, and eat those pigs all up.” He went down the chimney and landed in a pot of boiling water. He ran away and never came back. The third little pig invited the first little pig and the second little pig to stay with him in his cozy brick house. 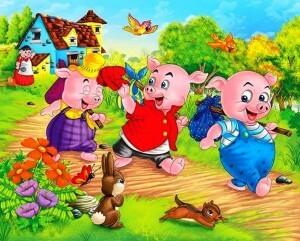 The three little pigs visited their mother every Sunday for dinner and they all lived happily ever after. Just as Storyteller Bill finished the original version of the Three Little Pigs, the clock on the wall ticked 4:30 PM. The storytelling session was over. The “Can Dos’ didn’t want to leave, but it was time to go; besides, there was next week to look forward to when Storyteller Bill would share how he changed the Three Little Pigs. The “Can Do” Recreation Center had an open house to introduce all the families on “Can Do” Street to the new programs that the “Can Do” kids could participate in during the fall and winter sessions. Oh, there were the old favorites, too, but new is always fun. One of the programs, in the new brochure, caught Wendy’s eye…storytelling. Given how much Wendy loves to write, she really wants to learn all she could about being a good storyteller. Just as Wendy was asking her mom if she could sign up for storytelling, Miss Sue, the director of the “Can Do” Recreation Center came into the room. Wendy and her mom took their seats and gave Miss Sue their full attention. “Good morning everyone, and welcome to our new program session,” said Miss Sue. ” Who likes to listen to stories?” Just about everyone in the room raised their hands. “That’s good,” said Miss Sue, “because storytelling has been around as long as there have been people on this earth. Storytelling has been handed down from one generation to another. Before most people could read and write, stories were told by word of mouth. Certain people, in each village or town were given the job of learning the stories of their people and telling them to younger generations. The story teller was the town or village historian as well the person who taught life lessons through stories. Sometimes the storyteller would just tell funny stories. 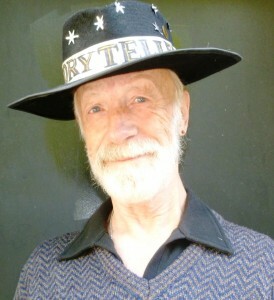 Boys and girls…be sure to read the next post about storytelling when Storyteller Bill talks about giving stories the endings you want them to have. The Saturday programs at the “Can Do” Street Recreation Center were in full swing. It was the first meeting of the “Can Do Kids Chefs Club. They were making chocolate chip cookies under the watchful eyes of Grandma Hattie and Grandma Frances. So remember boys and girls at home, don’t take a lick of batter; it can make you sick!